The Campus Avenue Field boasts an AstroTurf 12 surface that plays host to varsity contests in field hockey and men’s and women’s lacrosse. 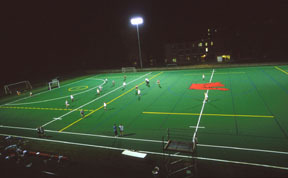 With full lighting, the synthetic turf field gives Bates teams the opportunity to practice day or night in weather that would prohibit the use of a grass field. Club and intramural programs, essential elements of residential life at Bates, benefit by being able to schedule evening events that will not conflict with varsity programs. The Campus Avenue Field was built in the summer of 2000 and saw its first play that fall sports season.